Thanhouser Career Synopsis: Harry E. Aitken was prominent on the film scene during the teens and was involved with many corporations and interests. He was closely associated with Charles J. Hite, John R. Freuler, and others in the formation of the Majestic (1911), Reliance (1912), Mutual (1912), and other companies and ventures. 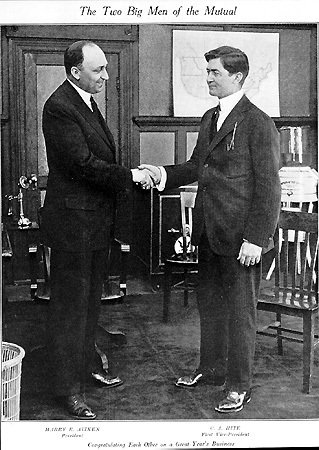 With his brother Roy and John R. Freuler, he was an investor in the Thanhouser Film Corporation, having arranged the sale of the Thanhouser Company to Charles J. Hite and his associates on April 15, 1912. Aitken withdrew from Mutual in June 1915. Biographical Notes: Harry E. Aitken was born in Waukesha, Wisconsin on October 4, 1877. His advanced education was obtained at Carroll College. Early in his business career he was a principal in the formation of the Federal Life Insurance Company, of Chicago, which became extraordinarily successful and furnished the capital for his other ventures. He entered the motion picture industry as an investor in the Western Film Exchange, in Milwaukee, a firm which branched to St. Louis, expanded, and became the Swanson-Crawford Company. Aitken came to New York City, against opposition from competitors who were cognizant of his keen business ability, and by April 1913 he controlled five film exchanges there. Aitken was a bachelor at the time and lived in the Waldorf-Astoria Hotel, which at the time was considered to be one of the city's finest hostelries. He managed the Reliance and Majestic companies, which, after the new Thanhouser studio was completed in 1913, had their films processed by the Thanhouser laboratory. At the time Aitken was also involved with the New York Motion Picture Company. A biographical sketch of him appeared in the April 26, 1913 issue of The Moving Picture World. He was the prime organizer in 1914 of the financial arrangements for the production of D.W. Griffith's epic film, The Birth of a Nation, which caused a sensation upon its nationwide distribution in 1915. The financial arrangements with Griffith caused dissention among his fellow associates at Mutual, a situation which eventually led to his withdrawal in June 1915 from the Mutual Film Corporation. He sold his stock in Mutual and certain Mutual-affiliated companies to John R. Freuler in November 1915. In the same year he organized the Triangle Film Corporation. In the autumn of 1916 Aitken's home address was 130 West 57th Street, New York City. He was married for a time, but soon quarreled with his wife and got a divorce. The union produced no children. Harry E. Aitken died of a heart attack in Chicago, Illinois on August 1, 1956. Some of his business papers are preserved by the Wisconsin State Historical Society.